So awesome.In the locker room with the team.Taking shots from center ice at practice.Sherman in Van-City!!! Sherman's in my town!? Awesome! Gotsta go wander around Robson Street at lunchtime and look for the heavily dreadlocked man. CANHawk wrote: Sherman's in my town!? Awesome! Gotsta go wander around Robson Street at lunchtime and look for the heavily dreadlocked man. I used to work at the Levi's on Robson Street. Great days. Miss them. Yeah, Robson isn't quite what it was in it's prime anymore, but it's still pretty cool. Still one of the best places in town to go see some rich dude's trophy wife spend the family fortune. Having already lived through losing a professional sports team in the middle of the night; screw you. I went back to the old Levi's store a year ago and it'd completely changed. I'm guessing new owners. It was more like a boutique. When I was there they had a huge 501 wall and I remember a German guy requesting 30 pairs of 34-32's in black. Believe it or not, that was an exciting day. Until Seattle gets an NHL team, GO CANUCKS! 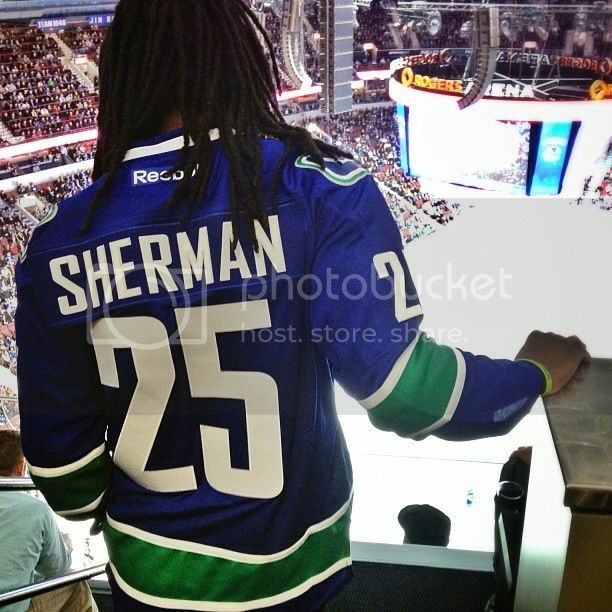 Is it wrong that I want a Sherman Canucks jersey now? God I hate the offseason! Oh look! Red Bryant took a dump today. Breaking news! SalishHawkFan wrote: God I hate the offseason! I'm kind of with you on this one. Sherman doing a little cross promotion in a foreign land is a bit of a far cry from Red defecating! Evil_Shenanigans wrote: Sherman doing a little cross promotion in a foreign land is a bit of a far cry from Red defecating! But the end results of red defecating are about the same as Canucks hockey. With that being said, I can't expect Sherman to know that, and I hope he made a few more Seahawks fans out of his visit.